All the news from Fukushima is very bad. This will continue for the rest of our lives. Like Chernobyl, the tendency for urgency will drop over time as people get used to the mess and a fatalist feeling of nothing can be done spreads deeper and deeper just like the present ‘China syndrome’ (sic) event. Of course, this movement towards the center of the earth due to gravity means it will metaphorically come out the other side in the US, not China. The fact remains, we are possibly witnessing something much more dangerous than Chernobyl. Chernobyl dumped immense amounts of toxins and radiation across all of Europe. But Fukushima is more insidious: it is entering the water table of the biggest ocean on earth, the Pacific, and Japan’s water table which the population needs to use for business, agriculture and living in general. Just this week, TEPCO released, only in Japanese, a report on this China Syndrome event. They finally have admitted to what I claimed would happen: the containment vessels are being systematically eaten by a molten mass of core materials. 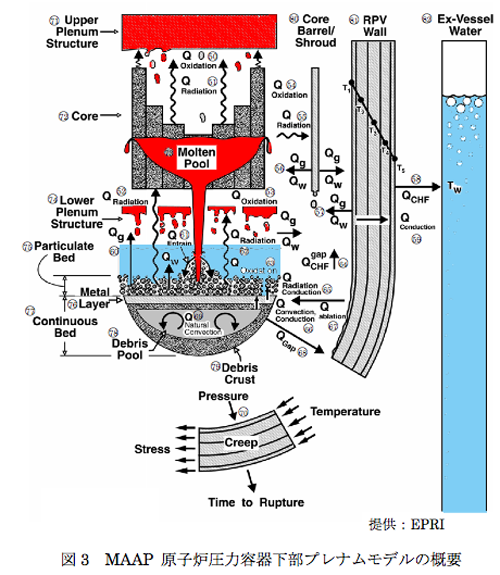 They are, as I explained in the past, chemically reacting with cement which is not rock but rather, is a water-permeable material that reacts to heat which is why fireproof materials have to be used when building incinerators, for example. Here is one news story from this last two weeks about the continuing dangers at Fukushima. The Dragons that live in these reactors have to be groomed and fed water or they will roar back into full bellow: Architect of Reactor 3 warns of massive hydrovolcanic explosion | Fukushima Diary. It is obvious from the diagrams that the materials have fallen into these indentations in the cement and have been cooking merrily away, eating up the cement and now, probably the steel container holding everything. Already, Half of radioactive materials from Fukushima fell into sea: study – The Mainichi Daily News. The ministry drones are going insane. They are doing very bizarre things trying desperately to show us that the mess in Fukushima isn’t a big deal: Environment Ministry official under fire for dumping radioactive soil near home – The Mainichi Daily News. Here is another professor furious with all of these lies, and I agree with him, some of us figured out from day one, what was really going on: Kyoto U. Prof: I always argued that containment is broken — Said melted fuel may already be 40 feet underground. I agree with him. The Dragons have escaped all human controls at this point. If true, there will be a spreading sense of final doom in Japan that will be inescapable. No cherry blossoms of hope will undo the ultimate mess. They never got the water levels high enough to completely protect the cores in this reactor. But then, it doesn’t matter anymore since the meltdown pretty much completed by the time water came back into the containment vessels. 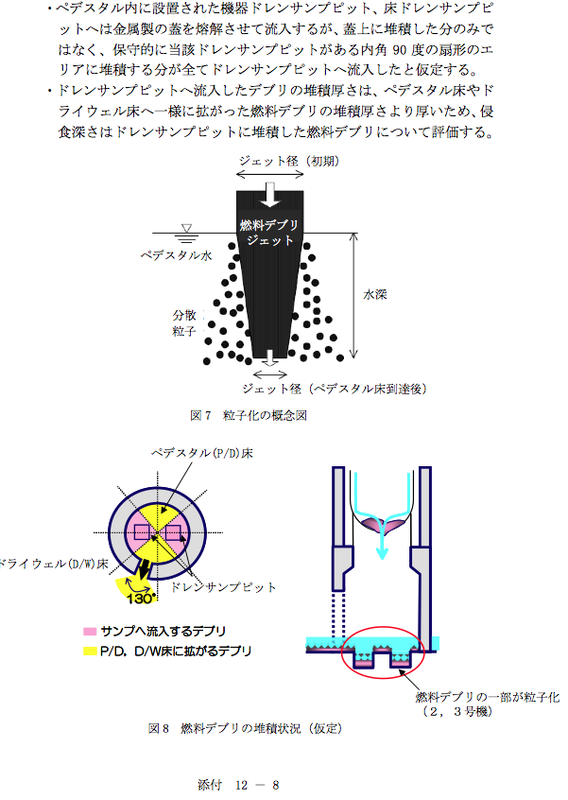 AP: New gov’t study rasies possibility of “structural damage to reactor’s foundation” — Erosion of concrete could be deeper than Tepco claims shows rising concern. And TEPCO continues to be behind the ball on telling the truth. This is supposed to be good news: Most radioactive cesium piled up within 2 centimeters of soil surface but it isn’t. This is because the BURNED materials may be on the surface but the WATER TABLE is now being polluted and this is not only underground by insidious and moves via capillary actions into increasingly distant locations. Some of the contamination is over 1200 Sv/h. Any human trying to do anything near these nodes of pollution would die pretty quickly. As the EU and US struggle with a banking meltdown that never seems to cease (it is also in China Syndrome meltdown!) we see Japan, struggling to continue to dominate China, falling off the ecological and evolutionary cliff into nuclear hell. And this is a total catastrophe that can’t be jiggered away by a central bank. This is harsh reality. Oh what a melancholy time this is. I don’t see what all the excitement is about. So some nuclear materials make it into the ground water or ocean. So what. The ocean can neutralize anything put into it as it has for eons. The nuclear bombings of WW2 didnt really cause all that much damage (aside from direct loss of life) and Chernobyl didnt shut down Europe when essentially the same thing happened there. Nuclear energy is a plague to the Earth. There is no way to guarantee 100% safe removal of used materials other than to launch them into space, which is moronic. Nuclear energy, if anything, was/is a distraction from real free energy. The ocean is the seat of all life. The ocean currents affect weather, and the radiation will certainly go up into the atmosphere from the ocean in the course of natural processes. The species in the oceans will all be affected. Jaques Cousteau, famous oceanographer, basically said when the ocean goes, so does mankind. I have no further comments as it is staggering to consider what damage has been done, between the Gulf of Mexico BP, Corexit travesty and the incomprehensible event at Fukushima. Seize the day I guess is about it….cause we probably do not have too many left. Watch for diarrea, nosebleeds and extreme fatigue. Jews did Fukushima. Ample proof available. ELAINE: Mother Nature brought us Fukushima. TEPCO brought us the cover up of what is really going on. Not one “Jewish” person had a thing to do with this. The nuclear power industry is international, Asian, American and European in nature and is all due to people wanting a free ride. Only it isn’t a free ride at all, it is riding a dragon from literal hell. show the proofs of jews involvement in Fukushima !! in 911 that is pretty clear to most people. I’m pretty sure those diagrams that are in English are taken right from original Westinghouse documents…that’s why they are in English. Tepco did not translate them for our benefit. Which means Westinghouse always knew their design was faulty and dangerous and capable of melt through. Oops..Fukushima reactors are General Electric design….same company with all those TV ads lately telling us how their technology saves cancer patients. Though I’m sure Westinghouse reactors aren’t any better. No such thing as a safe nuclear reactor design….oxymoron or what. xerxes, did you learn sientz in a circus? see nulkular fission transmutes the radioactive atom into something not radioactive, because its not da same atom furzurmo. si, it’s simple dats why they call it fizzun, because da protonz get all broke up. dats how dey stop demselvz frum been radioaktiv. but da rich uraniums and plutoniums and cesiumz in Fukushima, keep on stayeen demselvez becaz dey jest kipp on shuutin radiashun until dey can only shuut de haf of da radiashun becauz dey get to bee az old az da havlive dat dey got. den dey onlee shuut da halv of da radiashun afta, dat why dey calz it da havliv. dats how em unitary reactionz be, dey reakt on demselves, but dey donna reakt wit ozaselves, like da seewata dat you bring ups. dey jes go on poizonin da seewata unteel deez reel reel short particle/wavy funchun tingies jus kil dem own selvez by gettin auld. They never planned for the worst-case scenario, IE an earthquake and tidal wave, it may be they did, but found the plant would not be economic, so went with a bad case scenario. What is this crap about blaming JEWS…try looking in the mirror,humans as a whole are to blame for screwing up the earth sooooooo stop pointing fingers.Just another LAME EXCUSE TO HATE. Yes, unthinking people who like to load blame on some scapegoat. We have to examine things in reality and stick to facts. Fact about Japanese nuclear power: it is ALL insane due to Japan being one of the world’s least geologically stable places! There is NO WHERE safe in Japan for nuclear power and I have said this all my life. Now, the Japanese people believe this, too. They wish to get out of the nuclear power business and like Germany, are moving this way at this point. Yes, correct. That is what the old Mothra/Godzilla movies were auguring – a horrible fear of the nuclear power that was being hoisted on Japan starting sixty years ago. However I bring it up again, nuclear power does not have an off switch and unless there is a support population tending the plant, it is a potential atom bomb waiting to go off. Unlikely, but if the fuel at the bottom of the pool is now breeding, a good shockwave from a hydrogen gas explosion can be the slap that it needs to go into an uncontrolled fission reaction. The idiots who helped TEPCO claiming Fukushima was safe are now suffering leukemia, rumored to up 700% since last year. The so called “China Syndrome” should be renamed to “Japan Syndrome” or “Fukushima Syndrome”. Anyone have thoughts or opinion on whether the U.S. population is likely to incur any threats from radioactive-tainted foods if there is a melt through the floor of Fukushima and then a diffusion into ground water in Japan? @ Urbara https://emsnews.wordpress.com/2011/12/01/fukushima-enters-china-syndrome-meltdown-is-destroying-cement/#comment-250842 .. I doubt the radioactive particles can diffuse into the air, because of their very high atomic weights and density. The nuke waste “corium” white-hot blob in the bottom of the basement does not *need* to breed. The little-advertised fact is that spent fuel still has as much as 90% of ultraheavy fissionable isotopes in it. The technical term is “burnup”, and they take the fuel out of a reactor after burning only ~10% of it because neutron-absorbing byproducts make it no longer able to be reliably managed with the control rods. OK, I looked at the article now. Not mentioned at all are the spent fuel pools. Those things had 2 to 4 reactors’ worth of fuel rods in them, and they must have contributed their contents to the corium blobs by now, as well. It looked pretty bad to me as soon as I saw the footage of the hydrogen explosions. That was the indication that water cooling had failed, and it always puzzled me when Tepco announced that they had everything under control by hosing the place down with seawater or whatever. Now we know it was always a worst-case event, and the only thing they have accomplished by pumping water into the buildings is to scatter radwaste all over the place, and wash a bunch of hot cesium, strontium, iodine, etc. into the sea. There is a metal called Thorium that could fuel nuclear power plants instead of uranium. It is a much less dangerous metal with a much shorter half life. Since we know how dangerous our current uranium plants are, why isn’t there a stronger push to use a less dangerous metal? Of course a renewable green energy source would be best, but in the meantime why isn’t there more discussion and push to wean ourselves off uranium? Like you, Jason was aware of the radiation-disaster to the oceans immediately. When we were kids, the oceans were touted as an unending resource. Now, they are rapidly dying, and can hardly stand another hit in addition to the North Pacific Gyre Garbage Patch (and other Gyres), the Gulf of Mexico dying from farm-chemical effluent and oil, over-grown red tides, etc. Although, at this point, we may yet have opportunities to anticipate and develop a future on our planet, and maybe elsewhere. We will never be rid of the purveyors of “good news”, even as more damning information pours in every month or so about Fukushima. These were the last questions asked as Kirk Douglas, cornered on top of the bridge, turned and looked at his first mate and said nothing. There was no plan B. There was no escape. This movie was made to highlight the real dangers of nuclear energy, but it was ignored like so many others. There never has been a plan B for Fukushima or any other nuclear reactor. Someone said that shooting the nuclear waste into outer space was “moronic”. Why? What options do we have now? Only the sun can absorb this toxic mess and not blow up, so why not shoot it towards the sun? Is it because there is no money in it? The Jew/Zionist/Isreali connection to Fukushima can summarized in one word – STUXNET. The Stuxnet Virus the Israelis designed to attack nuclear facilities in Iran attacks Siemens operating systems and was reported in Fukushima in the months before the Tsunami. What it did was to disable the automatic shut down system which should have kicked in but didn’t and that is the source of the meltdown. The Yids have really done it this time. ELAINE: That has to be the stupidest thing I have read here yet. Japan is not the only country who was dumb enough to build a Nuke Plant on the coast. 1. 2004 Indian Ocean 9.1 Subduction Event. 2. 2010 Chile 8.8 Subduction Event. 3. 2011 Fukushima/Tohoku 9.0 Subduction Event. Recent research has proved the Event took place.. it was a record setting 9.2 Subduction Earthquake that caused massive tsunami’s to wash miles ashore throughout California, Oregon, Washington, and southwestern Canada, and even sent a Tsunami racing across the Pacific and into the east coast of Japan! Japanese scientists have recently confirmed this event took place! Many geologists and scientists are now warning that the Cascadia Subduction Zone has registered an enormous increase in pressure build up following the Fukushima event, as this event caused the Asian Plate to move eastwards, thus moving the island of Japan a couple METERS to the east, and further away from the mainland coast. This pressure buildup raced across the Pacific Plate, which in turn has put all that pressure into the Cascadia Subduction Zone and many experts have warned of a potential catastrophic Mega Thrust event in the region taking place within the next 50 years. Furthermore, the Diablo Canyon Power Plant is also location very near the famous San Andreas Fault zone. Looks like the U.S./ Canadian West Coast is up next for this type of disaster! There was at least one hydrogen gas explosion that Tepco admitted and Elaine had the videos posted. There is a reason I keep coming back here after all, in spite of our mild disagreements. While this is not the slap trigger that is built into rapid fission devices by the military, it could be if there is enough pressure in the explosion. Okay you probable know the word. The breeze and the seance. You probably know this, however most of da peeps don’t know, the trigger is just a bomb with a good shape concetrating the charge. I assumed from day one that all the hot rods melted down, and the control rods did not melt down in perfect alignment with them. While I said the chances are low, yes, it could go boom. how about you launch that rocket with ‘nulkular waste’ in orbit over where you live. Hopefully only you occupy that orbit because I sure as hell don’t want a Challenger episode raining down heavy isotopes into the ionosphere where I live. No, I’m actually in pretty good agreement with you. Just pointing out that it is not necessary for a corium blob to “breed”, though it’s probably doing that as well, in its completely uncontrolled condition. Yes, it could go “boom” and be the biggest dirty bomb in history. There are probably 100 bombs’ worth of material in each reactor’s corium blob, and it only has to have the right composition/configuration for a short interval of a few microseconds… It tends to avoid those configurations however, because when it gets close, it rearranges itself, sort of like the Godiva experiment. Yes, I’ve heard of the LFTR. It looks good on paper, and I understand they built one at ORNL back in the day and ran it for a while. But it won’t catch on with the MIC for one reason: it does not create suitable weapons material. And now that Elaine has told us how crazy those people are, I’m more cynical than ever and do not think anything so practical will ever be built. OK one more remark and then I’ll shut up, promise. It almost seems as if the Japanese authorities think they can put out a nuclear fire with water. Those of us with a little science background and knowledge understand that they are dealing with fundamental forces at least 3 or 4 orders of magnitude more powerful than the forces that hold ordinary matter together. It’s like thinking you can eat a piece of steel because you just ate a sticky bun for breakfast. And my gawd, they are making a mess of it! On the bright side, if the concrete base of that thing is really as thick as shown, there is hope that the corium will melt up enough glass to dilute itself out and stop the fission. Of course decay heat will insure that it remains white-hot for many decades, but at least it won’t be making more fission products as it goes. 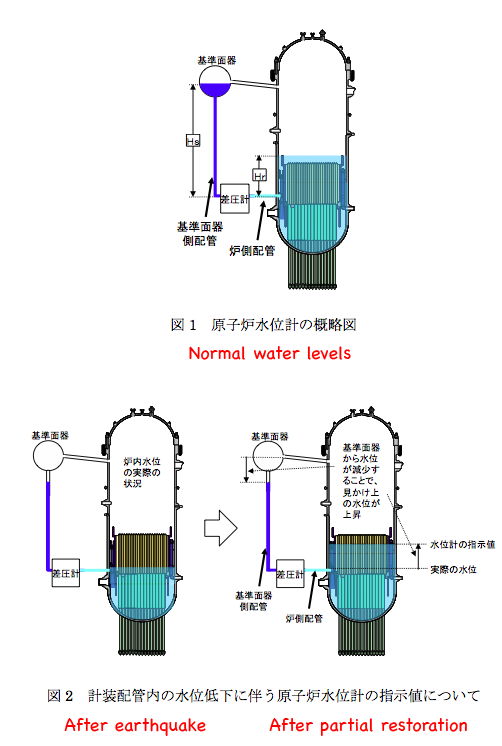 Just a correction, the final image “Contamination levels inside Fukushima Reactors” show the readings are in units of mSv/h, not Sv/h. Look at the left side of the first two diagrams and the right side of the third diagram to see the small boxes with “mSv/h” inside them. That 1200 mSv/h converts to 1.2 Sv/h. As far as I can see with the copy of that image, the highest reading that I noticed was 4700 mSv/h (4,7 Sv/h). Still quite deadly for humans. “Many geologists and scientists are now warning that the Cascadia Subduction Zone has registered an enormous increase in pressure build up following the Fukushima event, as this event caused the Asian Plate to move eastwards, thus moving the island of Japan a couple METERS to the east, and further away from the mainland coast. “This pressure buildup raced across the Pacific Plate, which in turn has put all that pressure into the Cascadia Subduction Zone and many experts have warned of a potential catastrophic Mega Thrust event in the region taking place within the next 50 years. I do not believe that “many geologists and scientists are now warning that the Cascadia Subduction Zone has registered an enormous increase in pressure build up following the Fukushima event”. No links were given to substantiate that claim … and it does not make sense. And the mental picture given of what happened during the Honshu megathrust event is not correct. “Japan” did not move east a couple of meters…. it was a portion of the eastern-most coast of the island of Honshu that moved east by that amount. That is because subduction megathrust events are caused by stick-slippage dynamics, where the subducting plate plate sticks against the the over-riding continental plate, which causes, over hundreds of years time, buckling upwards of the continental plate and pushing, with ever increasign pressure, of the edge of the continental plate backwards in the direction of the continental body. And while the contenental plate is pushed upwards in a buckling manner, the sea floor (subducting oceanic plate) is forced downward, since the two plates are locked and stuck. But then when the pressure of the sticking point is so great that it overcomes the sticking forces, BANG a great earthquake occurs as the stuck area fractures and breaks away. This results in allowing the seafloor of the oceanic plate to freely lurch forward and under the continental plate, while at the same time, the continental plate, which had buckled up and had been pushed backwards, inland, lurches forward, over the oceanic plate, allowing the “buckled up” land mass to unbuckle, subside and move in a direction over the oceanic plate. So if anything, the Honshu megathrust earthquake would *relieve* pressure on USA west coast subduction, since the the western edge of the subducting pacific plate in Japan, which had been held back, under great pressure, from moving away from western USA, suddenly broken free and lurched *away* from the USA and dove under Japan, relieving enormous amount of pressure that had been built up! As you point out, the difference between the magnitude 9.2 subduction earthquake event known to have occurred off WA/OR and a magnitude 7.5 earthquake which the Diablo Canyon Nuke Power Plant in California has been upgraded to withstand, is equal to 9.2 minu 7.5 equal to 1.7 magnitude. Well a 9.2 earthquake has more shaking amplitide by a factor of 50! … since the shaking amplitude difference is given by 10^1.7 = 50. And the total enegy release in the 9.2 earth quake is greater by a factor of 355! … since the energy release difference is given by 31.623^1.7 = 355. So a 9.2 earthquake near Diablo will result in a factor of 50 (5000%) more shaking intensity that that plant is designed to withstand, and a factor of 355 (35,500%) more quake energy release than it is designed to withstand. Caveat: The Diablo power plant is abot 400 miles south of the closest edge of the subducting plate off NW USA, and about 800 miles from the center area of that subducting plate. So any earthquake generated by the subduction of the Juan De Fuca plate (plate of concern, which subducting udner NW USA) is going to be greatly reduced in impact by the time it arrives at Diablo. The plant is only 43 miles from the San andrea fault though; but fault-slippage quakes are less likely to be at very high magnitudes, compared to quakes.caused by subduction stick-slippage. So, all considered, I do see much threat to the Diablo plant if it can wirstand a magnitude 7.5 earthquake. So, all considered, I don’t see much threat to the Diablo plant if it can wirstand a magnitude 7.5 earthquake. Leuren Moret, Nuke Expert: US practicing radiation genocide. The reactor in California is OLD. Old cement is not nearly as strong as newer cement, for example. Entropy, you know. Ditto, the metal parts. So, a NEW plant MIGHT survive a 7.5 earthquake but an old one won’t, remember, the quake hitting Fukushima wasn’t at 9.0, it was much less since the plant was further away…yet it destroyed the container’s by cracking them. There was an article from one of the major news agencies that was in most newspapers, about the state of reactors in the USA. I can’t recall if it was a response to Fukushima or Fort Calhoun right now, but the sad truth is that many, many of the reactors here are ancient rustbuckets that barely manage to hang together on a good day. There were pictures of cracked concrete, patched with what looks like concrete-patching goop from your local hardware store. Rusting pipes dripping cooling water. Brimming over-the-top spent fuel pools. And etc. The article, typically printed on page 4, quickly disappeared into lining bird cages and wiping up dog messes. I had a link to the AP or UPI or whatever feed, but haven’t tried to look at it recently. Not sure where the bookmark is in my jungle of bookmarks. Bottom line is, the public, which has the attention span of a fruit fly, has forgotten all about it, but every one of these reactors is just a giant dirty bomb waiting, waiting… they will be dangerous for centuries, for millennia. This is probably pointless, since you only hear yourself, but I did not suggest putting it into orbit over ANY planet. Please learn to read. If one does explode on the way to the sun, then how is that different than what just occurred in Japan? Will it contaminate the entire Pacific Ocean… oh wait! Fukushima already did that. So… what’s left? Just YOUR backyard? I have no interest in all the other technical comments here, as they simply will not matter 50 million years from now while these reactors are still stewing in their own juices, and occassionally burping. ELAINE: What he was referring to is the fact that rockets can malfunction, blow up while being launched, etc. Which is why people freak out when they hear that someone might launch nuclear materials into space. Space-launching the radwaste is a non-starter. There are just too many millions of tons of it. There isn’t enough energy on the planet to make the rocket fuel for that project. Inside reactor 4 building, after the blast. “Millions” of tons, you say? That’s more than I thought there was. Thanks for that info, Urban. I guess that answers my question in a reasonable, rational way. I proposed it because no one ever thought about or suggested how to clean it up. It must be melted back into its original state somehow, and the only thing hot enough to do that and disperse it evenly would be the sun. Guess we will live and die with it. I don’t know if the actual figure is millions. But there’s a lot. The fact is we shall *not* launch it into space. We might build LFTRs and burn it up before we attempt to space-launch it. But in the aggregate, I believe we humans are too stupid to do either thing, and will attempt to muddle through, pouring water on fires that cannot be put out. One would glassify the high-level waste, cast it into large blocks of concrete, and drop them in deep ocean trenches where (we hope) they will be dragged down into the mantle by subduction. By the time the stuff comes out of volcanoes, millions of years will have passed (we hope). The other method would be to use the Onkalo project in Finland or start some others like it, to physically bury the containers under a half mile or so of granite. Then pour more gravel and concrete and stuff into the tunnel and more or less disguise the site so it will be forgotten… and that might work (maybe). And are hideously expensive. This is the killer item. The expense! And they won’t fix this easily. Remember: nuclear power plants are supposed to make profits for everyone, not cost a fortune!